Planning a trip to Vancouver & Whistler? Here are a few highlights of what to do, and where to stay if you're traveling in November! It was a 5 day trip. Arrived in Vancouver first night. Spent 2 days in Whistler, and 2 days in Vancouver. Looking for a short walk to a stunning waterfall on the way to Whistler? Located 20 minutes south of Whistler, Brandywine Falls is a must-see waterfall. An easy walk through some snow, and you'll see a breathtaking 70m waterfall. Fun fact: apparently the origin of the name came from a wager for a bottle of brandy from two surveyors to guess how high the falls were. You can also get your instaworthy "I'm on a train track" shot in the snow on your way to Brandywine Falls. If you're looking for an adventurous snow activity besides snowboarding and skiing, check out Blackcomb Snowmobile. Take a moment to take in the exhilarating views while riding up Blackcomb Mountain. Very scenic if you go during snow season. If you bike occasionally, you'll pick it up pretty quick. I definitely want to try an ATV tour next time when it's drier. 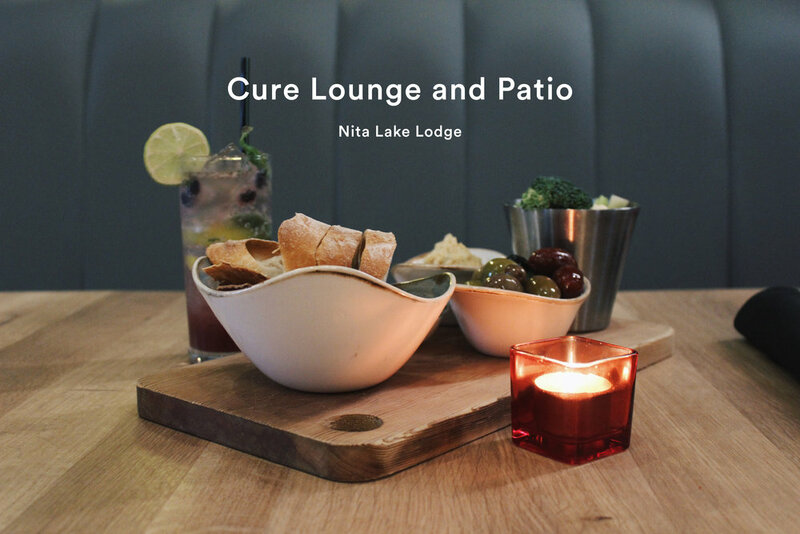 If you're planning to stay a few nights in Whistler, I highly recommend staying at Nita Lake Lodge, a luxury boutique hotel facing the Nita Lake. The suites feel very luxurious and upscale if you're looking to indulge. Their oversized suites, full-service spa and hottubs, and stunning lakeside view will keep you coming back. There's also a beautiful lounge & patio downstairs where I stopped by for a small bite. I tried their Cure Taster, which is a plate of hummus, raw vegetables, crackers, sliced baguettes, and olives ($12), perfect for satisfying late night hunger. The bartender saw me taking photos of my food with my DSLR and immediately made me a complimentary blueberry infused mojito. Shoutout to the bartender at Nita Lake Lodge! After Whistler, the next stop was Vancouver! 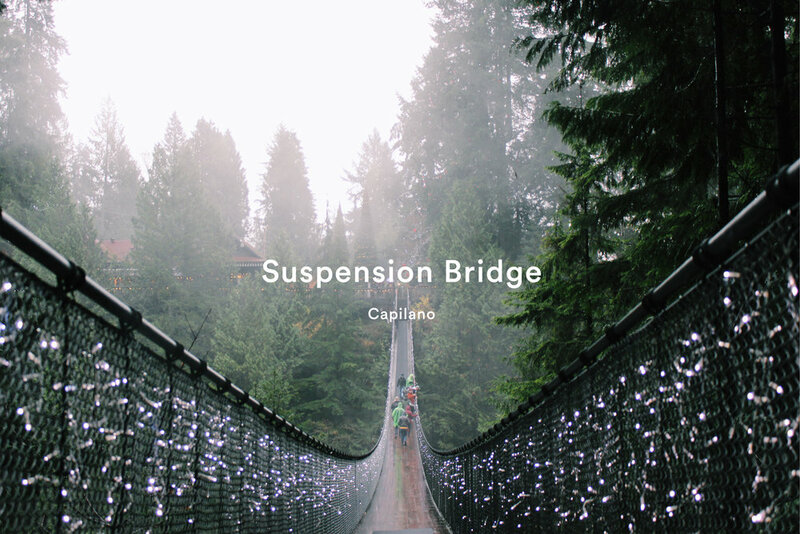 The infamous suspension bridge above the Capilano River is adorned with lights around this time of year. It is Vancouver's most popular must-see spot. If you're planning to go during the rainier months, dress warmer than I did! I really should have been wearing a raincoat or layered more. Not going to lie, I did it for the photos. They do offer rain ponchos, so all you really need to do is dress warm and wear waterproof shoes. Once you're on the bridge, the view is absolutely stunning. The bridge does get pretty crowded especially when you are trying to take photos, but other times, it clears up, so just be patient! Also make sure to do the Cliff walk and Treetop Adventures while you're there. I will say as someone who is afraid of heights, the suspension bridge wasn't scary at all, but the cliff walk made me nervous. This is most likely because the cliff walk has a much narrower walking path and you can see directly below you! But that's just me. If you're looking to stay in downtown Vancouver, check out Delta Hotels Vancouver Suite. I didn't get too many photos of the room, but you can see the rooms here. Some notable things I liked were the marble tabletops, ring lit bathroom, and the view. Stanley Park - Didn't have time to check out Stanley Park, but it's also a popular spot to visit.